2. Unclipped Wings - If a bird is to be allowed freedom outside of its cage, it is very important the flight feathers be properly clipped. They should be clipped so that the bird can still glide gracefully and safely to the ground. If the feathers are not clipped correctly, or if several primary wing feathers have grown back after a molt, an alarmed bird may end up flying erratically around the house and possibly flying through an open doorway and ending up in the top of a tree! If a bird becomes frightened it may mistake a window or mirror for open spaces, and end up with a concussion. Although birds rarely break their necks with such an injury, often compression fractures in neck vertebrae result from flying into objects. Birds can develop concussions, bleeding inside the brain, fractures, lacerations, ruptured air sacs and other serious and potentially deadly injuries. It is amazing to hear people say that their bird is fully flighted and it “never” flies away from them and then we receive a call from that very same person telling us how their bird has escaped and flown away and they are heartbroken. The horrible dangers of a pet bird alone and unprotected outdoors are too numerous to even imagine. Birds indoors have flown into pots of boiling water, open commodes and drowned, windows, mirrors, fondue pots and lighted fireplaces, to name just a few more household hazards. 3. Toxic Fumes - There are quite a few dangers under this heading to be aware of. Non-stick cookware and other household items possessing a non-stick surface made from polytetrafluoroethylene (PTFE) are toxic to birds. The gas released is extremely dangerous to birds and can result in death within minutes. It does not have to be overheated either, even with normal usage, some fumes may also be released and you will never smell anything. Anything with a PTFE coating should never be used around birds period. Remember virtually "ALL" non-stick cookware, indoor cooking grills, drip pans, self-cleaning ovens, clothes dryers, new hair dryers, space heaters, irons, ironing board covers, waffle irons, deep fryers, heat lamps and other small appliances or their components may be coated with PTFE. If anything says “non-stick” be aware and leery. Unless the manufacturer can verify, in writing, that the product in question does not contain PTFE producing elements, assume it has them. Scented candles, potpourri, incense, plug-ins, as well as other products containing a high concentration of volatile oils (essential oils) can cause either stimulation or depression of the central nervous system, as well as possible irritation to the eyes, nose and upper respiratory tract, depending on the oil and concentration used. Birds are very susceptible to the effects of inhaled volatile toxins, including essential oils. Any volatile oil (fragrance) has the potential for causing illness and possible death in birds. Obviously the concentration in a product and the length of exposure are factors to be considered. Many manufacturers have started making their cleaning products more pleasing to the senses by including these essential oils also. Products containing a high concentration of volatile oils should be avoided completely if you own a bird. Usually the more "perfumey" the smell, the more toxic the product. Bug sprays, whether it's something an owner buys at the local hardware store, or even the local pest control company, can be very deadly to your bird. If your local pest control company claims their product is perfectly safe, ask them put it in writing. You may be surprised at how fast they will back off their claim of "perfectly safe". Birds should be removed from the home for at least 24 hours whenever pest control measure are used. Contrary to what many people still believe, those metal round Protective Mite Killers you hang on the side of a bird's cage are toxic. They do in fact contain an insecticide, however it is very doubtful they would kill any mites. They just might kill your bird however. Any product that states it is "safe" for animals, does NOT mean it is necessarily safe for birds. Birds are very different from dogs and cats. 4. Other Accidents - Some birds develop the "cute" habit of climbing down off of their cage to seek out favorite family members. A bird walking on the floor, especially a small one, may be easily injured by people who don't see it. Very few survive being stepped on. They can also be killed by being closed accidentally in doorways, vacuumed up, squished by recliners and foldout beds and also by owners sitting on them when they have crawled under cushions. Birds can also be electrocuted by chewing through electrical cords. 5. Other Pets in the Home - Birds should never be left unsupervised outside of the cage, never ever. If other pets, including other birds, share the same house and are unsupervised, it's an accident waiting to happen. Even if a pet dog or cat has acted completely trustworthy around the bird, it should not be trusted 100%. Many birds have died as a result of another housepet either "playing" too exuberantly with a bird, or from the pet biting or stepping on the bird. Birds may also injure each other. Toes are often the most commonly injured body part but bleeding may be serious, and can be even fatal. Larger birds may kill smaller birds and it can happen in an instant. Any animal bite should be considered extremely serious, possibly life-threatening. The bacteria found in the saliva and the mouth of a mammal can cause fatal septicemia (infection in the bloodstream) of a bird in very short order. Cat bites should be considered the most dangerous, as the Pasteurella bacteria commonly found in the feline mouth, are extremely hazardous to birds. Even a simple puncture by a tooth can result in a fatal infection. Scratches from claws are also extremely dangerous, as the risk of infection is very real. 6. Toxic Foods or Plants - There are some foods which can be very toxic to our birds. Chocolate, metabolite theobromide, is very toxic to both animals and birds. Although baker's chocolate and dark chocolate are the most toxic, milk chocolate is still a forbidden food for birds. Caffeine is metabolized differently in birds which also results in toxic compounds so caffeine drinks such as coffee, tea and sodas should not be given to our birds. Avocados are toxic to birds, with perhaps the skin and pit being the most dangerous parts. Raw onions should never be fed either. Many indoor and outdoor plants and trees can be toxic, even fatal, to birds. So when in doubt, throw it out. 7. Hand-Feeding Mistakes - It is our feeling unweaned baby birds should not be sold or given to inexperienced hand-feeders as many babies die needlessly because of handfeeding mistakes. It is not necessary for a baby bird to be hand-fed by the family purchasing it in order for it to become "bonded" to them. We have plenty of older rescued birds who are sweet and loving and were not hanfed by us. There are so many things that can go wrong during the handfeeding process such as feeding too hot or or too cold, mixing it incorrectly, storing it incorrectly, delivering the food improperly, forcing food into the baby resulting in aspiration pneumonia or injuring the mouth or crop with feeding equipment. The most common mistake is probably keeping the baby at the incorrect temperature. Food that is fed at too low of a temperature can result in a slowed down gastrointestinal tract which can be fatal if not corrected in time. Babies who are forced to eat may struggle and end up inhaling the formula which results in aspiration pneumonia. If a large amount of food is inhaled, the baby will die immediately, but if a small amount of food ends up in the respiratory tract, the aspiration pneumonia may result in the baby suffering for days, trying desperately to breathe before it dies. Bacterial infection, fungal infection and polyoma virus infection are the most common infectious diseases in baby birds, all can prove fatal, and are often not found in time by inexperienced handfeeders. 8. Human Errors - It is not recommended your bird be exposed to other birds unnecessarily. Many diseases of birds are airborne. Unfortunately, a bird can carry a disease, and be able to pass it to others without ever appearing ill. Proventricular dilatation disease (PDD), chlamydiosis (psittacosis), Psittacine Beak and Feather Disease (PBFD) and pacheco's disease may all be spread by birds that appear healthy in physical appearance. Giardia, a one-celled protozoal organism, can be spread by a bird ingesting food or water contaminated by the droppings of an infested bird. Exposing your pet bird to other birds, especially outside of your family, should be avoided whenever possible, or kept to an absolute minimum. Many bird owners make a common mistake when adding a new pet to the family. Regardless of where the bird came from it should be quarantined for a minimum of at least one month. There are very logical reasons for quarantining. If the new bird is harboring an infection, the stress of moving the bird to a new home may cause the bird to become ill. Quarantine protects your other birds from the risk of disease as well has protecting the new bird if one of your birds already living in the home has a sub-clinical infection that it could pass to the new bird. So quarantine protects the new bird and the existing flock. Never place a bird's cage where a heating/air-conditioning vent can blow directly at the bird. Such placement can cause respiratory problems and/or pneumonia resulting in a critically ill bird that may not recover. If you suspect your bird is ill, take it to an avian veterinarian. Do not buy over-the-counter so called antibiotics because they will not cure anything, and can worsen the problem in your bird or hide important symptoms until it is too late to save the bird. If your bird is sick, your bird needs to see a doctor immediately. 9. Heat exposure - Although our exotic birds live naturally in warm, tropical climates, they just like us cannot tolerate excessive heat. Children, dogs, cats, other pets and birds should never be left in a car during hot weather, even with the windows partially lowered. Temperatures inside a car can rapidly reach lethal levels. Also you should never place your bird's cage outdoors unless you know for a fact the bird can move into the shade if it becomes overheated at all times when outside. If the sun covers the cage completely as the day progresses, and the bird has no place to escape the sun, a bird may rapidly develop hyperthermia and die. An overheated bird will begin panting, and with panting, will also begin getting dehydrated. Most birds suffering from hyperthermia will try to get out of the sun, and may try to bathe to cool off. If the bird's body temperature rises high enough, it will seizure and die. Hyperthermia can also occur if a bird's cage is relocated by a window indoors with no shade to escape the sun. 10. Sleeping With Birds - Birds should sleep in their cages. Birds that are allowed to sleep in bed with their owners are at serious risk for suffocation or life-threatening trauma. There is always the chance that the bird will get lodged between the mattress and frame, smothered under a pillow, or be rolled over on during sound sleep. It has happened all too often to allow such a risk. If you choose to read or watch television in bed or on the sofa with your bird, make sure there is not a change you will doze off. If you feel the least bit sleepy, it is time to return the bird to its cage. 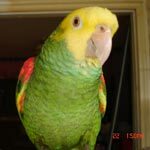 Although no one can foresee every possible accident or problem that can occur with our pet birds, by knowing the top ten hazards hopefully you can avoid some of the most common dangers and help keep your bird safe and happy. 1. Human medications was number 1 on the list and has been for several years past. The Poison Control Center received more than 78,000 calls involving pet poisonings by animals ingesting human drugs such as painkillers, cold medications, antidepressants and dietary supplements. Remember just one acetaminophen tablet can be deadly. 2. Insecticide poisoning comprised of more than 27,000 calls to the Poison Control Center and involved products used to kill fleas, ticks, and other insects. 3. Veterinary medications can also be deadly and consisted of more than 12,000 cases. When used incorrectly even medications for pets can cause harm. 4. Plants were involved in more than 9,300 cases and included plants such as lilies, azaleas, rhododendrons, sago palms, kalanchoes, scheffleras, and other toxic plants. 5. Rodenticides comprised approximately 8,800 cases of poisoning and usually involved rat and mouse poisons. 6. Household cleaners caused more than 7,200 calls and included things such as bleach, detergents, disinfectants, and other cleaning agents. 7. Chocolate is still a danger to our pets and was responsible for more than 4,800 cases. 8. Chemical hazards caused more than 4,100 calls and included items such as petroleum-based products, alchohols, acides, and gases. 9. Physical hazards managed to bring in more than 3,800 calls to the center for choking, intestinal obstructions, or other physical injuries. Ingestion of objects such as collars, adhesive tape, bones, paper products, and other common items added to the list. 10. And lastly, home inprovement products caused approximately 2,100 cases and involved things such as paint, solvents, glues, and other commonly used home construction products. First, the numbers of cases are completely disheartening! The thought of people SMOKING around parrots is too painful to think about. And, no, i DIDNT bother to read about wing clipping. 2, In only 24 hours a bird can die without water!? 3, I HAVE TO AND HAVE BEEN USING MY HAIR BLOW DRYER in close proximity....HAVE I JUST BEEN LUCKY THAT THEY DIDNT DIE? Yes, there are some errors but, all in all, it's quite a comprehensive list. As to a bird dying of dehydration in 24 hours... no, they don't die just because they go one entire day without water BUT the problem with dehydration is that they become very lethargic first [they even faint], leaving them without the actual energy to drink enough so, although they don't actually die in 24 hours, a budgie could become so weak that it would die in the following 24 hours even if you do give them water [the kidneys shut down and no longer work]. I am completely opposed to using bottles for birds. It's way too unnatural and, if you feed pellets and the bird doesn't eat enough produce, it's downright dangerous to their kidneys! And, Dana, that feeling of inadequacy you mention... well, welcome to the club! If you have a parrot and don't feel inadequate in your husbandry, you either do not care or know enough about them.